So far this year, I have seen 65 movies. 'The Neon Demon' isn't quite the best. It certainly isn't the worst. It is most definitely the most weird film I have had the pleasure of seeing this year. Jesse (Elle Fanning) is a 16 year old aspiring model who moves to LA in hopes to gain success. As soon as she gets there, she is tipped for the top much to the anger of many others who start to despise her and her natural good looks. Jesse also has to deal with a dodgy motel owner as well as photographers as she progresses as a model. She is now competition to the other dangerous models and has to look to overcome them. This is no ordinary film. There isn't much out there that is exactly like this movie. The way it's filmed, the way it tells it's story and also just the route the story takes. The film is most definitely odd, but good odd. Well that is subjective as two couples walked out of the movie- and that was before the film reached complete madness. This won't be for everyone, some will think it's awful, some will think it's a masterpiece. Nicolas Winding Refn has a reputation for his movies having little dialogue throughout them. For some this isn't enjoyable and might not work really that well. However Refn handles this phenomenally as he more than makes up for it with the visuals. The visuals progress the story so yu don't actually need lines to actually tell what people are feeling or thinking. The film is stunning to look at and everything is just beautiful to look at. Every shot is lined up perfectly and Refn clearly shows that he knows what he is doing. A true talent. There are some moments in his filmmaking though that do linger for too long. Some scenes last far too long and you may be sitting there wanting it to move on just that bit quicker. This happens a few times throughout the film which does hurt the film. Sure what you are looking is very well crafted but in a film you'd like it to move on when needed to do so. One of the other highlights of the film comes from the musical score. The music fits the style perfectly and really adds to the film. Some of it is repeated but it does an excellent job of creating a mysterious tone. 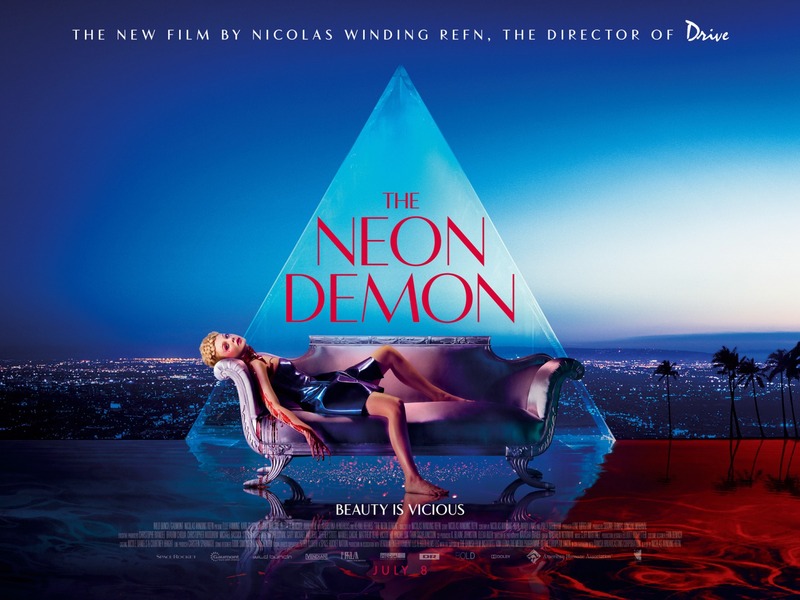 With there being little dialogue, the sound has to be made up otherwise and the music from Cliff Martinez does an incredible job who was also used for Refn's previous work like 'Drive' and 'Only God Forgives'. Huge credit must also go to the actresses and actors involved. Despite not being given a whole load of dialogue, they perform very highly and carry the story incredibly well. Fresh faced Elle Fanning is the protagonist who impressed me in the film as she captured everything that the character was meant to be and delivered it very well. Jena Malone also does very well in the film as sort of a helping hand until she is pushed too far by Fanning's character Jesse's new attitude and displeasure to her actions. Abbey Lee Kershaw and Bella Heathcoate play the two other main models in the film and deliver very well as well. You can see that the pair instantly don't like Jesse and can see this progress to give them quite a hunger to stop her. Some very good work from the talent involved. Keanu Reeves is also in this film and despite what many say about his abilities, he is one of my favourite actors to watch. Now this may just be my personal opinion and bias to him as an actor but I feel that the film certainly did not do enough with his character. There were many routes they could've taken with his character however they seemed to just have completely dropped the ball on his character. He disappears throughout a lot of the film and I feel his character could've had more meaning and use within the film. The last third of this movie is really when all the craziness starts to flourish. After leaving the cinema, some of it felt quite abrupt and shocking as if coming out of nowhere. After taking time to think over it, I remembered some clever signposting from earlier in the film that may lead the audience to expect this to happen but maybe not quite as brutal as they thought. It does seem a bit strange but once you reflect, it surprisingly makes sense and doesn't seem as unexpected. I really liked the way how this film handled the competition between the different models in this movie as well. Jesse is a natural when it comes to modelling side of things and as a fresh, new bright talent, she clearly ticks off some of the other models who have been there for longer. Although Jesse is just doing her thing, the others grow to detest her which is quite realistic. In quite a competitive market you can imagine it being like this. Just not as cynical as it leads to become fortunately. The highlight of the summer so far me, a great film. Not your film that won't cater to all audiences but well worth your time. Unsual but great. So have you seen 'The Neon Demon'? If so what did you think of it? I hope this review was useful for if you were planning on seeing the movie. I hope you give this one a shot especially if you are looking for something unique. Once again, thank you for taking the time to read my review, it is much appreciated!